Visit the Harbor Hills Clubhouse, tour the luxurious Canary and Royal Palm models and discover why Harbor Hills is the Dream Builder for the 4th Year in a row. *Please look at entries with red triangles for “Weekend Only” detail. At Arlington Ridge you’ll enjoy the shopping and daily conveniences you love without the crowds and congestion. The community features 18-holes of championship golf, both resort and lap style pools, outstanding fitness facilities, arts & crafts center, even a community cinema, restaurant and pub. And Arlington Ridge offers a lifestyle where every home is customized to be perfect for you and built with quality by FLC, one of Central Florida’s leading home builders for more than 35 years. Before you decide on your new home, please visit the community that truly earns its recognition and awards as “The Best Retirement Living In America”... Arlington Ridge. We believe in customer satisfaction and outstanding service. Bring your family and build a custom home in our desirable country club community and start living the life you’ve waited your whole life for. All within the Parade Craze® Map App! hts ts re res reserved. serv erved. ed. © Parade Craze. All rights reserved. © Parade Craze. All rights reserved. Directions: Take US 27, 8 miles south of Leesburg, to Arlington Ridge entrance (Address 4950 Arlington Ridge Blvd.). Check in at gatehouse and follow signs to Parade of Home entry. YES! We Do Granite Too! Directions: From Hwy 441, take 19 North through Eustis. After the orange juice factory, turn right on to Wafford; home will be on your left. 51 Wafford Street. Directions: From US-441 S in Mount Dora, turn right on Donnelly St. Turn left onto E 5th Ave. Turn right onto N Clayton St. Destination will be on the left. Sources: Visitlakeﬂ.com; Lakecountyﬂ.gov; Wikipedia.com; U.S. Census, 2012-2016 5-year American Community Survey Estimates, Scarborough 2017, R2. 2018, R1. and follow around to the model home. Personalize Your Home Area’s Largest Lighting Showroom Find fresh new solutions for all your lighting and fan needs at Besco Lighting & Fan Center. Stop in today or call to make an appointment with one of our lighting consultants. Offer is good toward your entire purchase. Present this coupon to redeem savings. Excludes sale items & prior purchases. Expires 3/31/2020. Directions: From the intersection of Highway 27 and FL-50, take the FL-50 west ramp toward Clermont. Continue 8 miles. Turn right on Villa City Road/ County Highway 565 and continue approx. 2.3 miles. Community is on the right. Directions: From FL Turnpike: Merge onto Hwy. 50 West. Turn right on 12th St./ CR-565A and right on CR-561/Lake Minneola Shores to community on the left. OR: From Hwy. 27:, merge onto Hwy. 50 West. Turn right on 12th St./CR-565A and right on CR-561/Lake Minneola Shores. Looking for room to grow? USB’s residential lending team is here to help you get into a home that ﬁts your family’s size and needs. Directions: FL 19-S to Citrus Ave in Howey. Turn left on Citrus Ave until it turns slightly right and becomes Camelia Way. Turn left on N. Valencia Ave. Home is on the left. Directions: Travel toward the town of Lady Lake on U.S. 27-441. Exit at Grifﬁn View Drive in Lady Lake, go east approximately 2 miles to Gray’s Airport Road. Turn left at the intersection and travel 1.5 miles to Lake Grifﬁn Road. At this intersection turn right. Follow signs. First National Bank of Mount Dora has been making homeowners’ dreams come true for more than 90 years. If you plan to build or buy in Lake or Sumter counties, come talk to us. 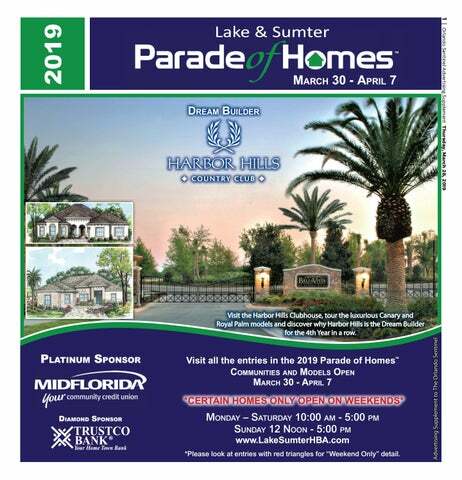 LOOK FOR LAKE COUNTY’S #1 CUSTOM HOMEBUILDER’S ENTRIES DURING THE 2019 PARADE OF HOMES. DETAILS ON BACK. 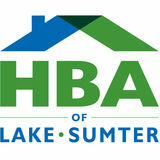 Kevco Builders will once again be a featured custom homebuilder during the 2019 Lake & Sumter Parade of Homes. Our Barcelona III is a new interpretation of our 2018 award winner. Featuring an open floor plan, kitchen island with quartz countertops, and upgraded trim work, door casing and crown molding in all the main areas. Beautiful stone accents on the exterior enhance the architectural style of Kevco’s signature spa-like master bath with stacked stone shower. Come see why the Stirling is our #1 selling floor plan. Beautiful views from the master, great room, nook and den, as well as a gourmet kitchen that flows into the main living area. A special bonus room can be used for a man-cave, she-space or family game room. Directions: Take 429 North to 46 West. Make a right on 46, right on Round Lake Road, left on Wolf Branch, left on Niles, then take a right into the community. JUST A FEW LOTS REMAIN IN MOUNT DORA’S ONLY 55+ COMMUNITY! With lot and home packages starting from the fr u low $200’s, you’ll enjoy Pringle standard upgrades including granite kitchen counter tops and crown molding in the main living area of your dream home. Two Donnelly Don Models–Move In Ready! $5,000 Closing Cost Incentive The Donnelly model features 3 bedrooms, 2 bathrooms and a large side lanai. With 2426 total sq.ft., the Donnelly is the perfect home. Or choose from one of our other popular floor plans like the Chadwick! Call us to reserve your lot and custom dream home today! on Hwy 19, .08 miles. Turn left on Barrington Drive. Go .02 miles. to home on the right. move-in ready homes. Choose from one and two-story designs, with as many as 5 bedrooms. Hanover Family Builders offers more than a great home. Hanover Family Builders has quick move-in homes available at all of our Central Florida communities! The Green Tag Sale special incentives are valid on contracts signed on or before April 7, 2019. Ask your Sales Consultant for complete details. Photos may contain options that are not standard and may not be available on all models, model types or homes. Developer reserves the right to make changes to ﬂoor plans, speciﬁcations, dimensions and elevations without prior notice. Prices, promotions, special offers, features, amenities and availability subject to change. CGC#1507971. Copyright ©2019 Hanover Family Builders. All rights reserved. More Home. More Lifestyle. BIG Savings! It used to be so EASY to NAVIGATE the market. What started as a newspaper, 140 years ago, is now a cutting-edge, multimedia company with a range of options designed to meet the ever-changing needs of consumers and marketers. From print and events to digital services and so much more, we continuously look to deliver results for your business. Let the Orlando Sentinel help you find your way and bring you the customers you need. Directions: Travel toward the town of Lady Lake on U.S. 27-441. Exit at Grifﬁn View Drive in Lady Lake, go east approximately 2 miles to Gray’s Airport Road. Turn left at the intersection and travel 1.5 miles to Lake Grifﬁn Road. At this intersection turn right follow signs. Directions: From Hwy 50 in Clermont, head north on Hwy 27, turn left onto Lake Minneola Shores (CR 561A), pass the main Palisades entrance (Palisades Blvd), turn right on Oak Breeze Court. Model is the third home on the right. • 4,553 Square Feet Total Under Roof • 4 Bedrooms • 3 Baths • 3 Car Garage • Covered Porch • Inside Laundry • Walk-In Closets with Wood Shelving • Granite/Quartz Counters • Wood Cabinets • Double Pane Windows • Highly Insulated • Wood/Laminate/Carpet/Tile Floors *Plans and amenities may be changed without notice. Directions: From 441 S turn right on Donnelly St. Turn right onto Old Eustis Road. Turn right onto Dogwood Circle (Dogwood Mountain). Turn right onto Magnolia Ending. House on left. Directions: From Hwy 441 to 44B, turn rt onto 44 and then rt at next light to continue onto SR 44E, turn rt in a ½ mile into community. Visit the Sales Center on left before community gate. Proceed thru gate and follow signs to model. Directions: From Leesburg Hwy 27/441, head north to Lady Lake, then west on Hwy 466 to ﬁrst light. Turn left on Rolling Acres Rd, heading South to Lake Ella Road. Turn left on Lake Ella Road 1/2 mile to gated entrance on left. Straight-ahead to 1112 Sugar Loaf Key Loop. “After we bought our lot, we started to meet with builders. We visited a Kevco home and our Realtor pointed out all the quality and “Standard Upgrades” throughout. When we met with Joe and his team, there was great communication, accountability and just an overall great vibe. Free 330 Day Interest Rate Lock - Most competitors offer far less! Low Closing Costs! Free Conditional Pre-Approvals Available! No PMI (Private Mortgage Insurance) Required! Financing Up to 89.5% of Appraised Value! No Appraisal Fee, No Points, No Prepayment Penalty! No Tax Escrow Required! Biweekly or Monthly Payment Options! See why Trustco Bank has been making the American Dream a reality for over 110 years. Visit any branch location or visit us online for more information! Please note: We reserve the right to alter or withdraw these products or certain features thereof without prior notification.